Uterine leiomyomas are among the most common problems encountered by the obstetrician/gynecologist. They are a frequent cause of pelvic pain and abnormal uterine bleeding and are thought to be involved in infertility. Uterine leiomyomas are the most frequent indication for hysterectomy in the United States. Many patients with symptomatic leiomyomas desire to retain the option of future childbearing or simply want to preserve their uterus. For these women, myomectomy, the removal of the myomas with reconstruction and preservation of the uterus, is an important option. Uterine leiomyomata, or fibroids as they are more frequently known, affect more than 20% of reproductive-aged women  . Patients can have a single myoma or numerous myomas. They are benign muscular growths in the wall of the uterus (figure1). The majority of myomas are small, do not cause symptoms, and are noted as incidental findings during routine pelvic examinations or pelvic imaging studies. When they enlarge, they can cause a mass effect, resulting in pelvic pressure or pain or a distortion of the uterine wall or endometrial cavity, which leads to abnormal uterine bleeding. More infrequently, myomas can prolapse through the cervix or may be confused for an ovarian mass. They can also cause problems in pregnancy depending upon their location and, in some patients, myomas are thought to be linked to infertility. Small uterine myomas visualized at laparoscopy. Although myomas are common, relatively few actually cause symptoms. Whether symptoms are present depends largely on a combination of size, number, and location of the myomas. In general, myoma growth is a result of the stimulation of estrogen, which is present until menopause. Over time, previously asymptomatic myomas may grow and become symptomatic. Conversely, many myomas begin to shrink as menopause removes the estrogen stimulation and many myoma-related symptoms resolve spontaneously shortly after menopause. Myomas are generally categorized by location. Intramural myomas are entirely or mostly contained within the myometrium (Figure2). Subserosal myomas project outward from the uterus (Figure 3). Submucosal myomas project into the endometrial cavity (figure 4). Pedunculated myomas are attached to the uterine wall by stalks and can be directed into either the peritoneal or the uterine cavity (figure 5). Submucosal myoma visualized at hysteroscopy. Pelvic pressure and pain symptoms are usually the result of mass effect. This can occur either from a single large myoma or from a combination of multiple smaller myomas. A fibroid uterus can grow to be quite large, at times reaching the size of a term gravid uterus. Interestingly, perhaps due to the slow growth and accommodation by the patient, some extremely large uteri are well tolerated by patients and do not require intervention. Some large myomas that impinge on the ureters can cause hydronephrosis and, very rarely, ureteral obstruction. 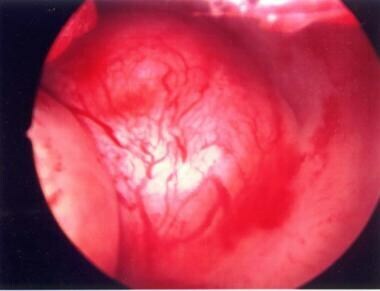 Bleeding abnormalities related to myomas are usually the result of distortion of the endometrial cavity. Unlike pain, which is usually caused by large or multiple myomas, some patients have significant bleeding from a single, small, strategically placed myoma. A submucosal myoma can prolapse through the cervix and may cause no symptoms or may cause significant bleeding or pain. Acute pain resulting from myomas is uncommon and usually stems from one of two possibilities. Pedunculated myomas can undergo torsion, causing the same severe pain as torsion of the ovary. Large myomas can outgrow their blood supply, leading to infarction and necrosis (degenerating myoma), which can be extremely painful. Lastly, prolapse of a myoma can be acutely painful. Although general agreement is lacking on the mechanism, myomas are also thought to be related to infertility, fetal malpresentations, and preterm labor. Possible mechanisms for infertility include distortion of the endometrial cavity and abnormal endometrial surface, thereby affecting both sperm transport and embryo implantation. Very rarely, myomas can be associated with erythrocytosis. This triad of myomatous uterus, erythrocytosis, and maintenance of normal hematologic values despite menorrhagia is called myomatous erythrocytosis syndrome. A number of etiologies have been hypothesized, but alterations in erythropoietin levels seem likely. Most leiomyomata are small and do not cause symptoms. Many are found as incidental findings after an obstetric or gynecologic ultrasonographic examination (Figure 6) or after a routine pelvic examination. Myoma identified on vaginal ultrasound. However, myomas can cause a number of symptoms. They can cause menstrual irregularities, particularly menorrhagia. This bleeding usually begins gradually and progressively worsens as the responsible myoma enlarges. A regular menstrual pattern should be still discernible despite the development of heavier or prolonged bleeding. If no regular pattern is noted, an alternative etiology such as chronic anovulation is more likely. Some patients present with progressive pelvic pressure, pelvic pain, or low back pain. The differential diagnoses for such symptoms is diverse; however, if they are noted in someone with a medium- or large-sized uterus (>14-15 weeks' size), the myomas are more likely to be contributing. Some fibroid uteri can grow out of the pelvis and into the abdomen, where they can be palpated by the patient. This can be disturbing, even if the patient is having mild or no symptoms. Some are visible, distorting the abdominal wall and, at times, making the patient appear pregnant. Most myomas grow slowly, and some remain relatively unchanged over prolonged periods. In the past, rapid growth was considered worrisome for leiomyosarcoma. In 1994, Parker et al showed that sarcoma was quite rare, even in rapidly growing uteri (0.27%). This risk was similar to the risk of leiomyosarcoma in myomas that were stable in size (0.21%). However, most of the patients were premenopausal. Rapid growth in postmenopausal women should be treated with greater caution. The diagnosis of a degenerating myoma should be considered in a patient with known fibroids and an acute onset of severe pelvic pain. The patient can also develop fever and an elevated white blood cell count that can be confused with infection. Upon examination, tenderness is usually quite specific and localized to the exact region of the degenerating myoma. Infertility evaluations usually include an investigation for myomas, specifically submucosal myomas. Ultrasonography, hysterosalpingography (HSG), sonohysterography, or hysteroscopy are used frequently because submucosal myomas may not be detectable during pelvic examination. Although less common, myomas can be found incidentally on speculum examination when they prolapse through the cervical os. Prolapsing myomas can also present with acute pain caused by “delivery” of the myoma through the cervix. Pedunculated myomas can also be mistaken for adnexal masses on routine pelvic examination. A definite risk exists for myoma recurrence after myomectomy and, with it, the need for a repeat surgical procedure in the future. If the patient no longer desires to retain her fertility or her uterus, hysterectomy is the usual procedure of choice. Interestingly, a number of women who have completed childbearing still request myomectomy for management of symptomatic myoma. This decision is usually motivated by patient preference and a desire to retain organs. Because the short-term risks of myomectomy compare favorably with hysterectomy  and despite the risk of recurrence, a myomectomy is not unreasonable for appropriately counseled patients. Although controversial, myomectomies are also performed for patients with infertility in the presence of uterine fibroids. Several studies suggest that patients with fibroids who are undergoing assisted reproductive technology procedures may have lower success rates compared with patients without fibroids. [13, 14] On the other hand, a Cochrane review on surgical management of fibroids in infertile patients did not find any statistically significant difference in clinical pregnancy rate, miscarriage rate or live birth rate between patients with uterine fibroids who had myomectomies and those who were managed conservatively. The authors caution that this data must be interpreted carefully because of the small nature of the existing studies and the significant need for additional data on the topic. Further, there is no randomized data regardingtheimpact of hysteroscopic myomectomy of fertility outcomes butseveral case series report favorable pregnancy rates. [15, 16] Current recommendations include consideration of myomectomy in infertile women after extensive evaluation eliminating other causes of infertility. Leiomyomata are usually confined to the myometrium but can occur in the lower uterine segment or cervix or can project out into the broad ligament. These myomas are frequently the most difficult to remove and are problematic during both hysterectomy and myomectomy. Within the uterus, the myomas can be at any level within the uterine wall. Intramural myomas are entirely or mostly contained within the myometrium(Figure7). Subserosal myomas project outward from the uterus (Figure 8). Submucosal myomas project into the endometrial cavity (figure 9). Pedunculated myomas are attached to the uterine wall by stalks and can be directed into either the peritoneal or the uterine cavity (figure 10). Myomectomy has a number of important contraindications. Myomectomy is not reasonable in the management of symptomatic leiomyomata in patients who no longer desire fertility or uterine preservation. It should not be performed if the possibility of endometrial cancer or uterine sarcoma have not been excluded. Generally, it should be avoided if the patient is pregnant. With the possible exception of otherwise unexplained infertility, it should not be performed in asymptomatic patients. No evidence supports prophylactic myomectomy of asymptomatic myomas for decreasing the risk of any adverse outcome later in life. 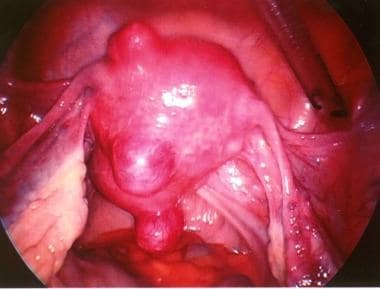 A relative contraindication to myomectomy is the strong possibility that a functional uterus could not be reconstructed after excision of the myomas. For myomectomy to be considered successful, reconstructing the uterus must be possible. Leiomyomata located in the region of the uterine vessels or broad ligament are sometimes difficult to remove without performing a hysterectomy. If the patient has numerous small myomas, removing them and reconstructing the uterus in such a way as to support a future pregnancy may be impossible. Excision of very large leiomyomata that constitute the entire anterior or posterior wall of the uterus may leave defects so large that closure is prohibited. Speert H. Obstetrics and Gynecology in America: A History. Chicago, Ill: American College of Obstetrics and Gynecology; 1980. 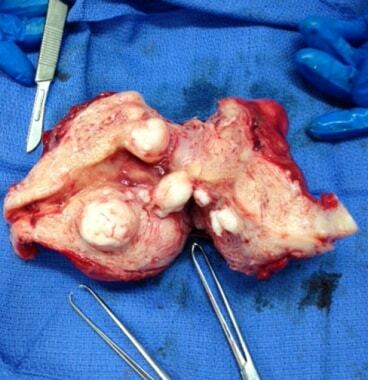 Hutchins FL Jr. Abdominal myomectomy as a treatment for symptomatic uterine fibroids. Obstet Gynecol Clin North Am. 1995 Dec. 22(4):781-9. [Medline]. Wallach EE, Vlahos NF. Uterine myomas: an overview of development, clinical features, and management. Obstet Gynecol. 2004 Aug. 104(2):393-406. [Medline]. Day Baird D, Dunson DB, Hill MC, et al. High cumulative incidence of uterine leiomyoma in black and white women: ultrasound evidence. Am J Obstet Gynecol. 2003 Jan. 188(1):100-7. [Medline]. Schwartz SM. Epidemiology of uterine leiomyomata. Clin Obstet Gynecol. 2001 Jun. 44(2):316-26. [Medline]. Keshavaraz H, Hillis SD, Kieke BA, Marchbanks PA. Hysterectomy surveillance -- United States, 1994-1999. MMWR Suvveillance Summaries. 2002. 51:(SS05):1-8. [Full Text]. Greenberg MD, Kazamel TI. Medical and socioeconomic impact of uterine fibroids. Obstet Gynecol Clin North Am. 1995 Dec. 22(4):625-36. [Medline]. Becker ER. National trends and determinants of hospitalization costs and lengths-of-stay for uterine fibroids procedures. J Health Care Finance. 2007. 33(3):1-16. [Medline]. Walker C, Stewart E. Uterine Fibroids: The Elephant in the Room. Science. Jun 2005. 308:1589-1592. [Medline]. LevGur M, Levie MD. The myomatous erythrocytosis syndrome: a review. Obstet Gynecol. 1995 Dec. 86(6):1026-30. [Medline]. Iverson RE Jr, Chelmow D, Strohbehn K, et al. Relative morbidity of abdominal hysterectomy and myomectomy for management of uterine leiomyomas. Obstet Gynecol. 1996 Sep. 88(3):415-9. [Medline]. Metwally M, Cheong YC, Horne AW. Surgical treatment of fibroids for subfertility. Cochrane Database Syst Rev. 2012 Nov 14. 11:CD003857. [Medline]. Stovall DW, Parrish SB, Van Voorhis BJ, et al. Uterine leiomyomas reduce the efficacy of assisted reproduction cycles: results of a matched follow-up study. Hum Reprod. 1998 Jan. 13(1):192-7. [Medline]. Eldar-Geva T, Meagher S, Healy DL, et al. Effect of intramural, subserosal, and submucosal uterine fibroids on the outcome of assisted reproductive technology treatment. Fertil Steril. 1998 Oct. 70(4):687-91. [Medline]. Shokeir TA. Hysteroscopic management in submucous fibroids to improve fertility. Arch Gynecol Obstet. 2005 Nov. 273(1):50-4. [Medline]. Jayakrishnan K, Menon V, Nambiar D. Submucous fibroids and infertility: Effect of hysteroscopic myomectomy and factors influencing outcome. J Hum Reprod Sci. 2013 Jan. 6(1):35-9. [Medline]. Arnold LL, Ascher SM, Schruefer JJ, Simon JA. The nonsurgical diagnosis of adenomyosis. Obstet Gynecol. 1995 Sep. 86(3):461-5. [Medline]. Murase E, Siegelman ES, Outwater EK, et al. Uterine leiomyomas: histopathologic features, MR imaging findings, differential diagnosis, and treatment. Radiographics. 1999 Sep-Oct. 19(5):1179-97. [Medline]. Wu T, Chen X, Xie L. Selective estrogen receptor modulators (SERMs) for uterine leiomyomas. Cochrane Database of Systmatic Reviews. 2007. [Medline]. Moss J, Cooper K, Khaund A, Murray L, Murray G, Wu O, et al. Randomised comparison of uterine artery embolisation (UAE) with surgical treatment in patients with symptomatic uterine fibroids (REST trial): 5-year results. BJOG. 2011 Apr 12. [Medline]. Seinera P, Arisio R, Decko A, et al. Laparoscopic myomectomy: indications, surgical technique and complications. Hum Reprod. 1997 Sep. 12(9):1927-30. [Medline]. Hasson HM, Rotman C, Rana N, et al. Laparoscopic myomectomy. Obstet Gynecol. 1992 Nov. 80(5):884-8. [Medline]. Darai E, Dechaud H, Benifla JL, et al. Fertility after laparoscopic myomectomy: preliminary results. Hum Reprod. 1997 Sep. 12(9):1931-4. [Medline]. Dubuisson JB, Chapron C, Fauconnier A, Kreiker G. Laparoscopic myomectomy and myolysis. Curr Opin Obstet Gynecol. 1997 Aug. 9(4):233-8. [Medline]. Hurst BS, Matthews ML, Marshburn PB. Laparoscopic myomectomy for symptomatic uterine myomas. Fertil Steril. 2005 Jan. 83(1):1-23. [Medline]. Palomba S, Zupi E, Falbo, A, et al. A multicenter randomized, controlled study comparing laparoscopic versus minilaparotomic myomectomy: reproductive outcomes. Fertility and Sterility. Oct 2007. 88:933-941. [Medline]. Lowes R. FDA Toughens Power Morcellation Warning. Medscape Medical News. Available at https://www.medscape.com/viewarticle/835375. November 24, 2014; Accessed: June 11, 2018. Stentz NC, Cooney LG, Sammel M, Shah DK. Changes in Myomectomy Practice After the U.S. Food and Drug Administration Safety Communication on Power Morcellation. Obstet Gynecol. 2017 Jun. 129 (6):1007-1013. [Medline]. Di Spiezio Sardo A, Mazzon I, Bramante S, et al. Hysteroscopic myomectomy: a comprehensive review of surgical techniques. Hum Reprod Update. Mar-Apr 2008. 14:101-19. [Medline]. Lethaby A, Vollenhoven B, Sowter M. Pre-operative GnRH analogue therapy before hysterectomy or myomectomy for uterine fibroids. Cochrane Database Syst Rev. 2001. CD000547. [Medline]. Deligdisch L, Hirschmann S, Altchek A. Pathologic changes in gonadotropin releasing hormone agonist analogue treated uterine leiomyomata. Fertil Steril. 1997 May. 67(5):837-41. [Medline]. Celik H, Sapmaz E. Use of a single preoperative dose of misoprostol is efficacious for patients who undergo abdominal myomectomy. Fertil Steril. 2003 May. 79(5):1207-10. [Medline]. Nezhat C, Nezhat F, Silfen SL, et al. Laparoscopic myomectomy. Int J Fertil. 1991 Sep-Oct. 36(5):275-80. [Medline]. Dubuisson JB, Chapron C. Laparoscopic myomectomy today. A good technique when correctly indicated. Hum Reprod. 1996 May. 11(5):934-5. [Medline]. Parker WH, Rodi IA. Patient selection for laparoscopic myomectomy. J Am Assoc Gynecol Laparosc. 1994 Nov. 2(1):23-6. [Medline]. Sinha R, Hegde A, Warty N, Patil N. Laparoscopic excision of very large myomas. J Am Assoc Gynecol Laparosc. 2003 Nov. 10(4):461-8. [Medline]. Choi CH, Kim TH, Kim SH, Choi JK, Park JY, Yoon A. Surgical outcomes of a new approach of laparoscopic myomectomy: single port and modified suture technique. J Minim Invasive Gynecol. 2013 Dec 30. [Medline]. Pluchino N, Litta P, Freschi L, Russo M, Simi G, Santoro AN. Comparison of the initial surgical experience with robotic and laparoscopic myomectomy. Int J Med Robot. 2013 Oct 3. [Medline]. Zullo F, Pellicano M, De Stefano R, et al. A prospective randomized study to evaluate leuprolide acetate treatment before laparoscopic myomectomy: efficacy and ultrasonographic predictors. Am J Obstet Gynecol. 1998 Jan. 178(1 Pt 1):108-12. [Medline]. Campo S, Garcea N. Laparoscopic myomectomy in premenopausal women with and without preoperative treatment using gonadoptropin-releasing hormone analogs. Human Reproduction. Jan 1999. 14:44-48. [Medline]. Cohen LS, Valle RF. Role of vaginal sonography and hysterosonography in the endoscopic treatment of uterine myomas. Fertil Steril. Feb 2000. 73:197-204. [Medline]. Perino A, Chianchiano N, Petronio M, et al. Role of leuprolide acetate depot in hysteroscopic surgery: a controlled study. Fertil Steril. Mar 1993. 59:507-10. [Medline]. Parazzini F, Vercellini P, De Giorgi O, et al. Efficacy of preoperative medical treatment in facilitating hysteroscopic endometrial resection, myomectomy and metroplasty: literature review. Human Reproduction. Sep 1998. 13:2592-7. [Medline]. Donnez J, Polet R, Smets M, et al. Hysteroscopic myomectomy. Curr Opin Obstet Gynecol. Aug 1995. 7:311-6. [Medline]. Campo S, Campo V, Gambadauro P. Short-term and long-term results of resectoscopic myomectomy with and without pretreatment with GnRH analogs in premenopausal women. Acta Obstet Gynecol Scand. Aug 2005. 84:756-760. [Medline]. Jansen FW, Vredevoogd CB, van Ulzen K, et al. Complications of hysteroscopy: a prospective, multicenter study. Obstet Gynecol. Aug 2006. 96:266-70. [Medline]. Propst AM, Liberman RF, Harlow BL, et al. Complications of hysteroscopic surgery: predicting patients at risk. Obstet Gynecol. Oct 2000. 96:517-20. [Medline]. Agostini A, Cravello L, Shojai R, et al. Postoperative infection and surgical hysteroscopy. Fertility and Sterility. Apr 2002. 77:766-768. [Medline]. Preutthipan S, Herabutya Y. A randomized comparison of vaginal misoprostol and dinoprostone for cervical priming in nulliparous women before operative hysteroscopy. Fertil Steril. Oct 2006. 86:990-4. [Medline]. Wheeless CR. Atlas of Pelvic Surgery. 3rd ed. Philadelphia, PA: Lippincott Williams & Wilkins; 1997. Rock JA, Jones HW. Te Linde's Operative Gynecology. 10th ed. Philadelphia, Pa: Lippincott Williams & Wilkins; 2008. Frederick J, Fletcher H, Simeon D, et al. Intramyometrial vasopressin as a haemostatic agent during myomectomy. Br J Obstet Gynaecol. 1994 May. 101(5):435-7. [Medline]. DeLancey JO. A modified technique for hemostasis during myomectomy. Surg Gynecol Obstet. 1992 Feb. 174(2):153-4. [Medline]. Fletcher H, Frederick J, Hardie M, Simeon D. A randomized comparison of vasopressin and tourniquet as hemostatic agents during myomectomy. Obstet Gynecol. 1996 Jun. 87(6):1014-8. [Medline]. Ginsburg ES, Benson CB, Garfield JM, et al. The effect of operative technique and uterine size on blood loss during myomectomy: a prospective randomized study. Fertil Steril. 1993 Dec. 60(6):956-62. [Medline]. Kongnyuy E, Wiysonge C. Interventions to reduce haemorrhage during myomectomy for fibroids. Cochrane Database of Systematic Reviews. 2007. [Medline]. Tulandi T, Murray C, Guralnick M. Adhesion formation and reproductive outcome after myomectomy and second- look laparoscopy. Obstet Gynecol. 1993 Aug. 82(2):213-5. [Medline]. Farquhar C, Vandekerckhove P, Watson A, Vail A, Wiseman D. Barrier agents for preventing adhesions after surgery for subfertility. Cochrane Database Syst Rev. 2000. CD000475. [Medline]. Carter JE, McCarus SD. Laparoscopic myomectomy. Time and cost analysis of power vs. manual morcellation. J Reprod Med. 1997 Jul. 42(7):383-8. [Medline]. Nezhat C, Nezhat F, Bess O, et al. Laparoscopically assisted myomectomy: a report of a new technique in 57 cases. Int J Fertil Menopausal Stud. 1994 Jan-Feb. 39(1):39-44. [Medline]. Zreik TG, Rutherford TJ, Palter SF, et al. Cryomyolysis, a new procedure for the conservative treatment of uterine fibroids. J Am Assoc Gynecol Laparosc. 1998 Feb. 5(1):33-8. [Medline]. Goldfarb HA. Laparoscopic coagulation of myoma (myolysis). Obstet Gynecol Clin North Am. 1995 Dec. 22(4):807-19. [Medline]. Goldfarb HA. Nd:YAG laser laparoscopic coagulation of symptomatic myomas. J Reprod Med. 1992 Jul. 37(7):636-8. [Medline]. Peacock K, Hurst BS. Laparoscopic Myomectomy. Surgical Technology International. 2006. 15:141-145. [Medline]. Parker W. Uterine myomas: management. Fertility and Sterility. Aug 2007. 88:255-271. [Medline]. Nezhat FR, Roemisch M, Nezhat CH, et al. Recurrence rate after laparoscopic myomectomy. J Am Assoc Gynecol Laparosc. 1998 Aug. 5(3):237-40. [Medline]. Pundir J, Pundir V, Walavalkar R, Omanwa K, Lancaster G, Kayani S. Robotic-assisted laparoscopic vs abdominal and laparoscopic myomectomy: systematic review and meta-analysis. J Minim Invasive Gynecol. 2013 May-Jun. 20(3):335-45. [Medline]. Seracchioli R, Rossi S, Govoni F, et al. Fertility and obstetric outcome after laparoscopic myomectomy of large myomata: a randomized comparison with abdominal myomectomy. Hum Reprod. 2000 Dec. 15(12):2663-8. [Medline]. Rossetti A, Sizzi O, Soranna L, et al. Long-term results of laparoscopic myomectomy: recurrence rate in comparison with abdominal myomectomy. Hum Reprod. 2001 Apr. 16(4):770-4. [Medline]. Alessandri F, Lijoi D, Mistrangelo E, et al. Randomized study of laparoscopic versus minilaparotomic myomectomy for uterine myomas. The Journal of Minimally Invasive Gynecology. Mar-Apr 2006. 13:92-97. [Medline]. Fukuda M, Tanaka T, Kamada M, Hayashi A, Yamashita Y, Terai Y. Comparison of the perinatal outcomes after laparoscopic myomectomy versus abdominal myomectomy. Gynecol Obstet Invest. 2013. 76(4):203-8. [Medline]. Corson SL, Brooks PG. Resectoscopic myomectomy. Fertil Steril. 1991 Jun. 55(6):1041-4. [Medline]. Corson SL. Hysteroscopic diagnosis and operative therapy of submucous myoma. Obstet Gynecol Clin North Am. 1995 Dec. 22(4):739-55. [Medline]. Gimpelson RJ. Hysteroscopic treatment of the patient with intracavitary pathology (myomectomy/polypectomy). Obstet Gynecol Clin North Am. 2000 Jun. 27(2):327-37, vii. [Medline]. Emanuel MH, Wamsteker K. The Intra Uterine Morcellator: a new hysteroscopic operating technique to remove intrauterine polyps and myomas. J Minim Invasive Gynecol. Jan-Feb 2005. 12:62-6. [Medline]. Indman PD. Factors affecting capacitive current diversion with a uterine resectoscope: an in vitro study. J Am Assoc Gynecol Laparosc. Feb 2004. 11:128. [Medline]. Indman PD. Hysteroscopic treatment of submucous myomas. Clin Obstet Bynecol. Dec 2006. 49:811-20. [Medline]. Loffer FD. Removal of large symptomatic intrauterine growths by the hysteroscopic resectoscope. Obstet Gynecol. Nov 1990. 76:836-40. [Medline]. Iverson RE Jr, Chelmow D, Strohbehn K, et al. Myomectomy fever: testing the dogma. Fertil Steril. 1999 Jul. 72(1):104-8. [Medline]. LaMorte AI, Lalwani S, Diamond MP. Morbidity associated with abdominal myomectomy. Obstet Gynecol. 1993 Dec. 82(6):897-900. [Medline]. Sawin SW, Pilevsky ND, Berlin JA, Barnhart KT. Comparability of perioperative morbidity between abdominal myomectomy and hysterectomy for women with uterine leiomyomas. Am J Obstet Gynecol. 2000 Dec. 183(6):1448-55. [Medline]. Frederick J, Hardie M, Reid M, et al. Operative morbidity and reproductive outcome in secondary myomectomy: a prospective cohort study. Hum Reprod. 2002 Nov. 17(11):2967-71. [Medline]. Golan D, Aharoni R, Gonen Y, et al. Early spontaneous rupture of post myomectomy gravid uterus. Int. J. Gynecol. Obstet. Feb 1990. 31:167-170. [Medline]. Ozeren M, Ulusoy M, Uyanik E. First-trimester spontaneous uterine rupture after traditional mymectomy: case report. Isr J Med Sci. Nov 1997. 33:752-753. [Medline]. Roopnarinesingh S, Suratsingh J, Roopnarinesingh A. The obstetric outcome of patients with previous myomectomy or hysterotomy. W.I. Med. J. Mar 1985. 34:59-62. [Medline]. Hockstein S. Spontaneous uterine rupture in the early third trimester after laparoscopically assisted myomectomy. A case report. J Reprod Med. 2000 Feb. 45(2):139-41. [Medline]. Pelosi MA 3rd, Pelosi MA. Spontaneous uterine rupture at thirty-three weeks subsequent to previous superficial laparoscopic myomectomy. Am J Obstet Gynecol. 1997 Dec. 177(6):1547-9. [Medline]. Arcangeli S, Pasquarette MM. Gravid uterine rupture after myolysis. Obstet Gynecol. 1997 May. 89(5 Pt 2):857. [Medline]. Paul P, Koshy A, Thomas T. Pregnancy outcomes following laparoscopic myomectomy and single-layer myometrial closure. Human Reproduction. Dec 2006. 21:3278-3281. [Medline]. Altgassen C, Kuss S, Berger U, et al. Complications in laparoscopic myomectomy. Surgical Endoscopy. Apr 2006. 20:614-618. [Medline]. Kim MS, Uhm YK, Kim JY, Jee BC, Kim YB. Obstetric outcomes after uterine myomectomy: Laparoscopic versus laparotomic approach. Obstet Gynecol Sci. 2013 Nov. 56(6):375-81. [Medline]. Cooper JM, Brady RM. Intraoperative and early postoperative complications of operative hysteroscopy. Obstet Gynecol Clin North Am. 2000 Jun. 27(2):347-66. [Medline]. Emanuel MH, Hart A, Wamsteker K, et al. An analysis of fluid loss during transcervical resection of submucous myomas. Fertil Steril. Nov 1997. 68:881-6. [Medline]. Hallez JP. Single-stage total hysteroscopic myomectomies: indications, techniques, and results. Fertil Steril. 1995 Apr. 63(4):703-8. [Medline]. Vercellini P, Maddalena S, De Giorgi O, et al. Abdominal myomectomy for infertility: a comprehensive review. Hum Reprod. 1998 Apr. 13(4):873-9. [Medline]. Fedele L, Parazzini F, Luchini L, et al. Recurrence of fibroids after myomectomy: a transvaginal ultrasonographic study. Hum Reprod. 1995 Jul. 10(7):1795-6. [Medline]. Finn WF, Muller PF. 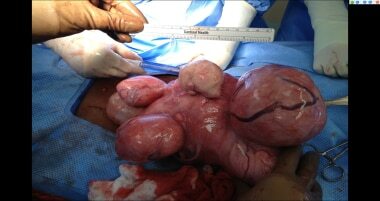 Abdominal myomectomy: special reference to subsequent pregnancy and to the reappearance of fibromyomas of the uterus. Am J Obstet Gynecol. 1950 Jul. 60(1):109-16. [Medline]. Brown AB, Chamberlain R, Te Linde RW. Myomectomy. Am J Obstet Gynecol. 1956 Apr. 71(4):759-63. [Medline]. Malone LJ. Myomectomy: recurrence after removal of solitary and multiple myomas. Obstet Gynecol. 1969 Aug. 34(2):200-3. [Medline]. Berkeley AS, DeCherney AH, Polan ML. Abdominal myomectomy and subsequent fertility. Surg Gynecol Obstet. 1983 Mar. 156(3):319-22. [Medline]. Garcia CR, Tureck RW. Submucosal leiomyomas and infertility. Fertil Steril. 1984 Jul. 42(1):16-9. [Medline]. Rosenfeld DL. Abdominal myomectomy for otherwise unexplained infertility. Fertil Steril. 1986 Aug. 46(2):328-30. [Medline]. Smith DC, Uhlir JK. Myomectomy as a reproductive procedure. Am J Obstet Gynecol. 1990 Jun. 162(6):1476-9; discussion 1479-82. [Medline]. Verkauf BS. Myomectomy for fertility enhancement and preservation. Fertil Steril. 1992 Jul. 58(1):1-15. [Medline]. Gehlbach DL, Sousa RC, Carpenter SE, Rock JA. Abdominal myomectomy in the treatment of infertility. Int J Gynaecol Obstet. 1993 Jan. 40(1):45-50. [Medline]. Acien P, Quereda F. Abdominal myomectomy: results of a simple operative technique. Fertil Steril. 1996 Jan. 65(1):41-51. [Medline]. Stewart EA, Faur AV, Wise LA, et al. Predictors of subsequent surgery for uterine leiomyomata after abdominal myomectomy. Obstet Gynecol. 2002 Mar. 99(3):426-32. [Medline]. Hanafi M. Predictors of leiomyoma recurrence after myomectomy. American College of Obstetricians and Gynecologists. Apr 2005. 105:877-881. [Medline]. Candiani GB, Fedele L, Parazzini F, Villa L. Risk of recurrence after myomectomy. Br J Obstet Gynaecol. 1991 Apr. 98(4):385-9. [Medline]. Seracchioli R, Manuzzi L, Vianello F, et al. Obstetric and delivery outcome of pregnancies achieved after laparoscopic mymectomy. Fertility and Sterility. Jul 2006. 86:159-165. [Medline]. Cela V, Freschi L, Simi G, Tana R, Russo N, Artini PG. Fertility and endocrine outcome after robot-assisted laparoscopic myomectomy (RALM). Gynecol Endocrinol. 2013 Jan. 29(1):79-82. [Medline]. Pitter MC, Gargiulo AR, Bonaventura LM, Lehman JS, Srouji SS. Pregnancy outcomes following robot-assisted myomectomy. Hum Reprod. 2013 Jan. 28(1):99-108. [Medline]. Doridot V, Dubuisson JB, Chapron C, et al. Recurrence of leiomyomata after laparoscopic myomectomy. J Am Assoc Gynecol Laparosc. 2001 Nov. 8(4):495-500. [Medline]. Taylor E, Gomel V. The uterus and fertility. Fertility and Sterility. Jan 2008. 89:1-16. [Medline]. Goldenberg M, Sivan E, Sharabi Z, et al. Outcome of hysteroscopic resection of submucous myomas for infertility. Fertil Steril. 1995 Oct. 64(4):714-6. [Medline]. Vercellini P, Zaina B, Yaylayan L, et al. Hysteroscopic myomectomy: long-term effects on menstrual pattern and fertility. Obstet Gynecol. 1999 Sep. 94(3):341-7. [Medline]. Fernandez H, Sefrioui O, Virelizier C, et al. Hysteroscopic resection of submucosal myomas in patients with infertility. Hum Reprod. 2001 Jul. 16(7):1489-92. [Medline]. Bernard G, Darai E, Poncelet C, et al. Fertility after hysteroscopic myomectomy: effect of intramural myomas associated. Eur J Obstet Gynecol Reprod Biol. 2000 Jan. 88(1):85-90. [Medline]. Litta P, Conte L, De Marchi F, Saccardi C, Angioni S. Pregnancy outcome after hysteroscopic myomectomy. Gynecol Endocrinol. 2013 Dec 5. [Medline]. Emanuel MH, Wamsteker K, Hart AA, et al. Long-term results of hysteroscopic myomectomy for abnormal uterine bleeding. Obstet Gynecol. 1999 May. 93(5 Pt 1):743-8. [Medline]. Hart R, Molnar BG, Magos A. Long term follow up of hysteroscopic myomectomy assessed by survival analysis. Br J Obstet Gynaecol. 1999 Jul. 106(7):700-5. [Medline]. Donnez J, Nisolle M, Clerckx F, et al. Advanced endoscopic techniques used in dysfunctional bleeding, fibroids and endometriosis, and the role of gonadotrophin-releasing hormone agonist treatment. Br J Obstet Gynaecol. 1994 May. 101 Suppl 10:2-9. [Medline]. Ben-Baruch G, Schiff E, Menashe Y, Menczer J. Immediate and late outcome of vaginal myomectomy for prolapsed pedunculated submucous myoma. Obstet Gynecol. 1988 Dec. 72(6):858-61. [Medline]. Ligon AH, Morton CC. Genetics of uterine leiomyomata. Genes Chromosomes Cancer. 2000 Jul. 28(3):235-45. [Medline]. Myomas and reproductive function. Fertil Steril. 2008 Nov. 90(5 Suppl):S125-30. [Medline]. Nkemayim DC, Hammadeh ME, Hippach M, et al. Uterine rupture in pregnancy subsequent to previous laparoscopic electromyolysis. Case report and review of the literature. Arch Gynecol Obstet. 2000 Nov. 264(3):154-6. [Medline]. Parker WH, Fu YS, Berek JS. Uterine sarcoma in patients operated on for presumed leiomyoma and rapidly growing leiomyoma. Obstet Gynecol. 1994 Mar. 83(3):414-8. [Medline]. Robotic-assisted laparoscopic vs abdominal and laparoscopic myomectomy: systemtic review and meta-analysis. Tiltman AJ. Smooth muscle neoplasms of the uterus. Curr Opin Obstet Gynecol. 1997 Feb. 9(1):48-51. [Medline]. Asgari Z, Hafizi L, Hosseini R, Javaheri A, Rastad H. Intrauterine synechiae after myomectomy; laparotomy versus laparoscopy: Non-randomized interventional trial. Iran J Reprod Med. 2015 Mar. 13(3):161-8. [Medline]. Raba G, Kotarski J, Szczupak K, Obloza B, Fudali-Walczak M. Uterus banding with the Osada method effectively reduces intraoperative blood loss during myomectomy. Minim Invasive Ther Allied Technol. 2016 Feb. 25(1):43-7. [Medline]. Submucosal myoma being resected hysteroscopically with a loop resectoscope. Hysteroscopic myomectomy. A 24-year-old woman with menorrhagia and severe anemia in whom hormonal treatment failed. Sonohysterography showed multiple submucosal fibroids. She underwent hysteroscopic myomectomy after administration of Depo-Lupron. Part 1. Video courtesy of Tarek Bardawil, MD. Hysteroscopic myomectomy. A 24-year-old woman with menorrhagia and severe anemia in whom hormonal treatment failed. Sonohysterography showed multiple submucosal fibroids. She underwent hysteroscopic myomectomy after administration of Depo-Lupron. Part 2. Video courtesy of Tarek Bardawil, MD. Robotic myomectomy. A 32-year-old woman was found to have a large fibroid during pregnancy. Postpartum, the fibroid caused pelvic pain and dyspareunia. 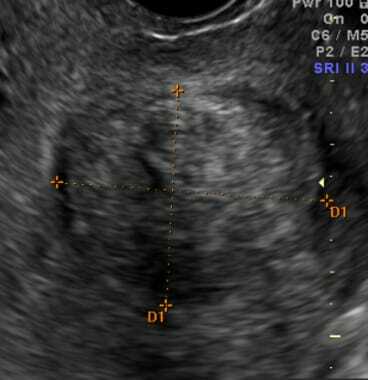 Pelvic ultrasonography revealed a 10-cm fundal transmural fibroid. Part 1. Video courtesy of Tarek Bardawil, MD. Robotic myomectomy. A 32-year-old woman was found to have a large fibroid during pregnancy. Postpartum, the fibroid caused pelvic pain and dyspareunia. Pelvic ultrasonography revealed a 10-cm fundal transmural fibroid. Part 2. Video courtesy of Tarek Bardawil, MD. Medscape Reference thanks Tarek Bardawil, MD, Assistant Professor, Department of Obstetrics and Gynecology, University of Miami Miller School of Medicine, for assistance with the video contribution to this article.